A couple of years ago, Google acquired the startupBehavio. One of the selling points behind Behaviour was how it used behaviour data from Phones to better understand human behaviour. It’s likely that Google acquired the company Zip dash back in 2004 to learn about real-time traffic data. A Google patent application published in the last week describes how Google might be using Mobile data from phones to map indoor spaces, combining the technologies behind Behaviour, with traffic monitoring from Zip-dash to better understand spaces that many people navigate through while carrying a mobile device that connects to the internet with wireless signals and carries sensor data that can indicate the location and movements of those devices. The patent tells us that current approaches to determine indoor locations of mobile devices are based on interior scans of wireless access points. Theses scans could be used to build a database that can model an indoor space by determining locations of the access points and their corresponding signal strengths at those locations. To create a database like this, an indoor wireless location provider would have to conduct site surveys at selected locations. An undertaking like this could require surveying tens of thousands of buildings and floors to determine the location of the wireless access points. And this database could might become stale and inaccurate overtime due to location changes in the access points after the surveys are complete. This patent is aimed at providing a scalable method that could be used to conduct site surveys to construct wireless access point models of an indoor location. This would be done by crowd-sourcing the wireless and INS (Inertial navigation systems) signals from multiple devices moving through the indoor location. The end goal of this would be to provide a more accurate and up to date model database of access points. The approach behind the patent is the following method. (1) Identifying a map of an indoor space, (2) Receiving inertial navigation signals (sensor signals from accelerometers, etc.) from a set of mobile devices moving through that indoor space and (3) Calculating user trajectories based on the inertial navigation signals. This method provides direction and speed of movement of the mobile devices being tracked. Tracking these trajectories helps to identify walkable areas of the indoor space being targeted, and where turns take place among these paths. The inertial navigation signals (INS) may include: accelerometer data, gyroscope data, and compass data. This is how large indoor spaces such as shopping malls transit stations, airports, and similar indoor places may be mapped by looking at sensor data and wireless access signals from those devices. The patent is: Crowd-Sourcing Indoor Locations Invented by: Faen Zhang, Edward Y. Chang, Yongqiang Huang, Shuchang Zhou Assigned to Google US Patent Application 20150204676 Published July 23, 2015 Filed: August 15, 2012 Abstract Aspects of the present disclosure provide techniques for constructing a scalable model of an indoor space using crowd-sourced inertial navigation system (INS) signals from mobile devices. (1) Other signals to identify locations for an indoor space may also be used that could include radio frequency (RF) signals, light, sound image recognition signals, and other types of signals and/or environmental factors or any combination of these. (2) The server building a database may look at map information, which could include floor plans representing an indoor space within a building. (3) “Beacon” messages may also be used to send out information to identify wireless network access points. The beacon messages may also include additional network access information which also assists devices in accessing the network. (4) The patent tells us that Personal Identifiable Information need not be collected, and may actually be removed in order to protect the privacy of the wireless network’s users. 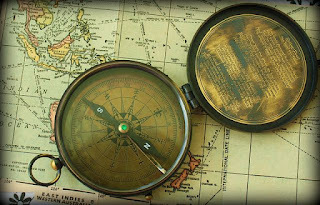 (5) A GPS receiver may be included in the mobile devices , that could be used to determine the geographic location of the client device, and could identify the device’s latitude, longitude and altitude position. (6) Mapping of an indoor space may help identify interior constraints, such as walls, which people cannot walk through, as well as frequent landmarks within that indoor space, such as offices, conference rooms, bathrooms. Take-Aways Having people provide data about their locations can be essential for their use of such services.